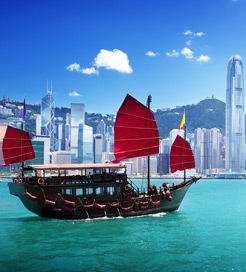 Hong Kong is an independent territory on China’s southern coast, famous for its impressive skyline and natural harbour. It’s situated just below the Tropic of Cancer and surrounded by the South China Sea, resulting in a humid subtropical climate. Well known as one of the world’s leading financial centres, it’s home to over 1,200 skyscrapers and is one of the most densely populated cities in the world. Contrary to the heavy economic influence, Hong Kong’s locals hold many intriguing superstitions. For example the number ‘4’ is never present on building floors due to its resemblance to the Cantonese word for ‘die’. It is also known as ‘where east meets west’, reflecting the blend of British Colonial history and traditional eastern customs. This is evident in the large number of western fast food chains among the Cantonese street food markets. Hong Kong is a fantastic place for your taste buds. The Temple Street Night Market is an animated hub of local produce, ranging from wonton soup and dim sum to CDs and homeware, all at negotiable prices. Travelling around the city couldn’t be easier, as it boasts one the most highly developed public transportation systems in the world, covering 90% of the population. Away from the bustling concrete jungle you’ll find many cultural sites and monuments. The Mai Po Nature Reserve on the north coast should be on your to-do list. Whilst strolling along floating boardwalks you’ll be surrounded by mangroves and tens of thousands of birds, depending on the tide. Make sure you bring binoculars and avoid wearing bright clothing as it may scare the wildlife. If you find yourself on Lantau Island, the Tian Tan Buddha statue is another must-see. It weighs an incredible 202 tonnes and sits above 260 steps, which are well worth the climb. Don’t forget you are forbidden to bring meat or alcohol into the Tian Tan grounds. Hong Kong is well connected from both China and Macau. There are routes to Hong Kong harbour, the airport and Kowloon port from Shenzhen and Guangzhou in south China. Journeys from southern China last around 45 minutes and run 2-7 times a week. If you’re travelling from Macau you can get to Hong Kong in an hour, with frequent services every day. Alongside TurboJET, the routes from Macau are also operated by Cotai Water Jet. Both companies offer a premium service with a selection of luxury cabins ranging from Standard to Premier Grand Class. So wherever you choose to go, you’re guaranteed to travel in style and at impressive speeds of around 45 knots. For more information, please visit our Ferries from Macau to Hong Kong page. For more information, please visit our Ferries from Dongguan Province to Hong Kong page. For more information, please visit our Ferries from China to Hong Kong page.